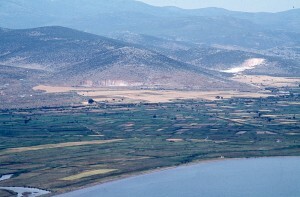 – An alluvial slope on which the lower town of Halos was situated. – The valley of the Amphrysos, a river fed by powerful springs, to the north of the city. – A spur and hilltop of limestone rock which dominated the upper and lower town of Halos to the west. – An estuarine area (salt marsh, nowadays a drained backswamp) to the east of the lower town. – An area with outcrops of conglomerate rock to the south. 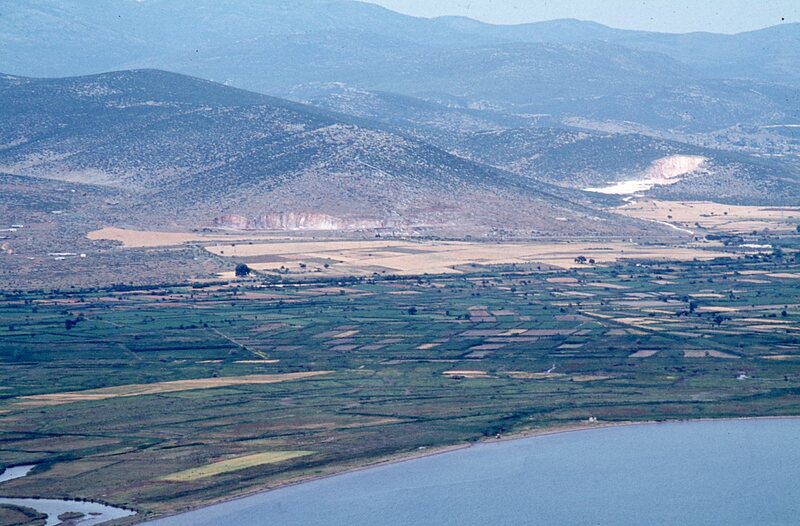 The hilltop was incorporated in the city’s 4.7-km-long enceinte and the city of Halos was on the other three sides protected by natural lines of defence: a river valley, a coastal marsh and an area with conglomerate rock which will have precluded the risk of a besieging enemy digging trenches and undermining the city wall. Along the North wall was the strongest natural defense line because an attack with heavy siegecraft through the low lying Amphrysos riverbed was almost impossible. Moreover, only a narrow passage between Kefálosis spring and the northern walls of the upper and lower town led to the city’s oddly situated Northwest Gate. The narrow passage could easily be defended by supporting fire from the towers of the circuit wall of the upper town. It is plausible that the construction of the city was directed against a potential attacker from the north.